There was a confusion with the labeling of the supplement; while most buyers received the new and improved labeling, some people got stuck with the old brand labeling when ordering online. A vast number of users adored Organic India Ashwagandha for many reasons. It is USDA certified, it can be found in many stores around the USA, they found it to be effective, the quality is above many other products on the market, and its a well made product for a reasonable price. The brand did undergo some changes in the last few years which does confuse users and sometimes bring uncertainty to the brand. However, this didn’t hold the brand back from becoming a one of the top recommended ashwagandha supplements for both first timers and experienced users. One serving of Organic India Ashwagandha recorded 800 mg of ashwagandha root extract containing 6.05 mg of withanolides (0.0075%). Overall, Organic India Ashwagandha scores a 4.5 out of 5 as our final assessment. No products perfect, although this one does come close. We don’t like that the company did not specify its withanolides content, which can be laboratory tested. 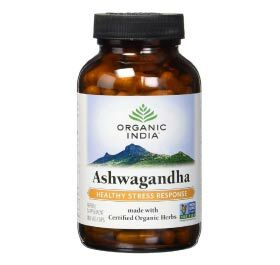 Aside from that component, Organic India Ashwagandha has been around for years and possibly one of the first few brands to market ashwagandha to the US market. Its a trusted brand that can be found in many health food stores, including Wholefoods and Earthfare. This product passes our ingredient quality rating and scored a five out of five. No filler ingredients is very nice to see. Non-gelatin capsules giving it a score higher than products that do use gelatin. Product contains just pure USDA organic ashwagandha. No gelatin capsules, organic Vegetable Pullulan Capsules. Current studies on ashwagandha show that a product should containing root powder or a root extract works best when its withanolides content is at least 0.3% and 1.5% – a key marker compound which may also play a role in the herb’s activity. Typically 10 mg to 30 mg of withanolides per serving. 3rd party testing shows that this product contains 6.05 mg of withanolides per 800 mg serving. One serving of this product recorded 800 mg of ashwagandha root containing 6.05 mg of withanolides, a less than 1% concentration (0.00756%). Organic India Ashwagandha passes our quality review and scores a five out of five on our quality rating score. USDA organic ingredients and vegetable based capsules. Sold in many retail stores along with Organic India’s other products such as Teas and other tinctures. Our only remark is the company does not label its withanolides content which we had to gather from a 3rd party lab testing company.